Denon AVR-X3400H. 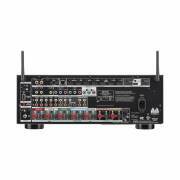 This 7.2-channel receiver offers high-quality sound with abundant wireless streaming features, plus full support for 4K Ultra HD video. It can even upscale standard- and high-definition video signals to 4K quality. Dolby Atmos and DTS:X bring movie soundtracks to life with immersive, multi-dimensional surround sound effects. Built-in HEOS technology lets you access all your music from your personal library, internet radio, and popular streaming services like Pandora®, Spotify®, and TIDAL through the ‘X3400H.This receiver can be easily integrated into a wireless multi-room audio system. Stream music to HEOS wireless speakers and components in different rooms, and control each room’s sound independently with the free HEOS app. The app lets you control playback, browse music sources, and select which rooms you want to use. Play the same music throughout your home, or listen to something different in each room. 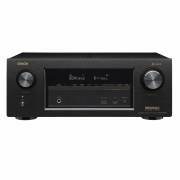 The Denon AVR-X3400H AV receiver features a powerful Class AB power amplifier section equipped with discrete high current power transistors. This discrete amplifier design delivers optimum realism and stunning dynamic range. By using high current, high power discrete power devices, the amplifier is able to easily drive high quality speakers. 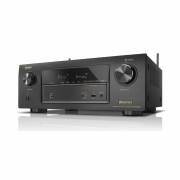 The AV receiver’s seven channel Class AB amplifier is rated at 105-watts (into 8-ohms, at 20-20kHz, with 0.08% THD, driving 2 channels). The AVR-X3400H’s seven discrete amplifier channels can be configured to accommodate your type of home theater setup. The AV receiver’s amplifier channels can be configured as Front Left/Right, Center, Surround Left/Right, and Surround Back Left/Right for Dolby TrueHD & DTS-HD 7.1ch playback. The Denon AVR-X3400H AV receiver goes beyond regular surround with the latest immersive surround sound formats – like Dolby Atmos or Dolby Surround and DTS:X or DTS Neural:X.
Dolby Atmos surround sound technology dispenses with channel-based coding in favor of more advanced object-based coding, giving the soundtrack designer the ability to precisely place sounds anywhere in the 3-dimensional space. Now you can enjoy this same award-winning technology at home with the AVR-X3400H that lets you to connect a 5.1 surround sound speaker system and 2 additional overhead speakers or 2 Dolby Atmos elevation speakers for the ultimate home theater experience. Dolby Surround offers an enhanced cinema experience to your 2ch or multichannel movie soundtracks using your existing 5.1ch, 7.1ch, or Dolby Atmos speaker setup. Dolby Surround enhances audio definition by improving the spatial dimension and overall audio definition of movie soundtracks. It does this by using four distinct surround zones that provide greater control over the exact placement of each detail in a movie sound track, so audio can be matched more accurately to the video on screen; this means more depth and greater realism for your movies. HDR provides enhanced picture quality by simultaneously enabling greater detail for both the dark and bright parts of an image. HDR reproduces a greater dynamic range of luminosity or brightness levels, creating greater contrast. This increased contrast reveals the subtle nuances of the image, from detailed blacks and shadows to the brightest whites and colors, plus greater depth. The receiver supports HDR 10, Dolby Vision, and HLG. 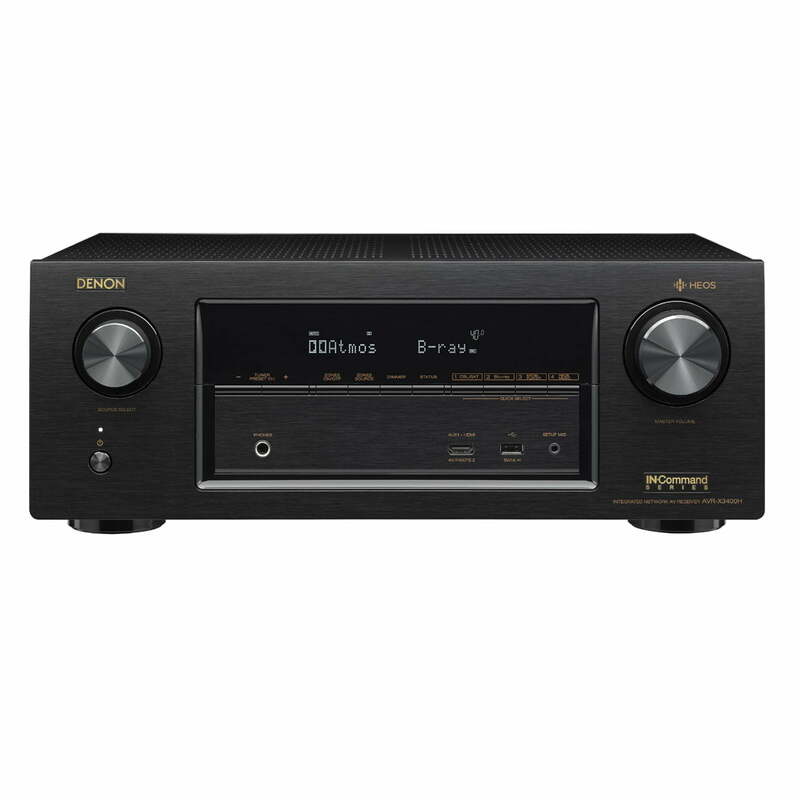 The Denon AV receiver’s sophisticated video processor provides upconversion from standard definition (480i/480p) and high definition (720p/1080i/1080p) sources to 4K Ultra HD (3840×2160 pixels), which lets you connect all your analog (composite/component) or digital (HDMI) video sources to the AVR-X3400H and then connect to your TV with just a single HDMI cable. Only the receiver’s main HDMI output supports video upconversion. When the AV receiver is in “Standby” mode and the HDMI Standby Pass-Through function is enabled, both audio/video streams from the receivers HDMI input will be output to your television, via the AV receiver’s HDMI monitor output. Once the receiver is turned “On”, only video will pass through the monitor output to your TV and the audio is directed to the receiver’s speaker outputs. Download the MultEQ Editor App onto your Apple iOS 8.0+ or Android OS 4.0+ devices for further sound customization and detailed tuning to more precisely tailor the sound to your room and personal preferences. The Denon AVR-X3400H comes with an IR remote for wireless operation of the AV receiver. 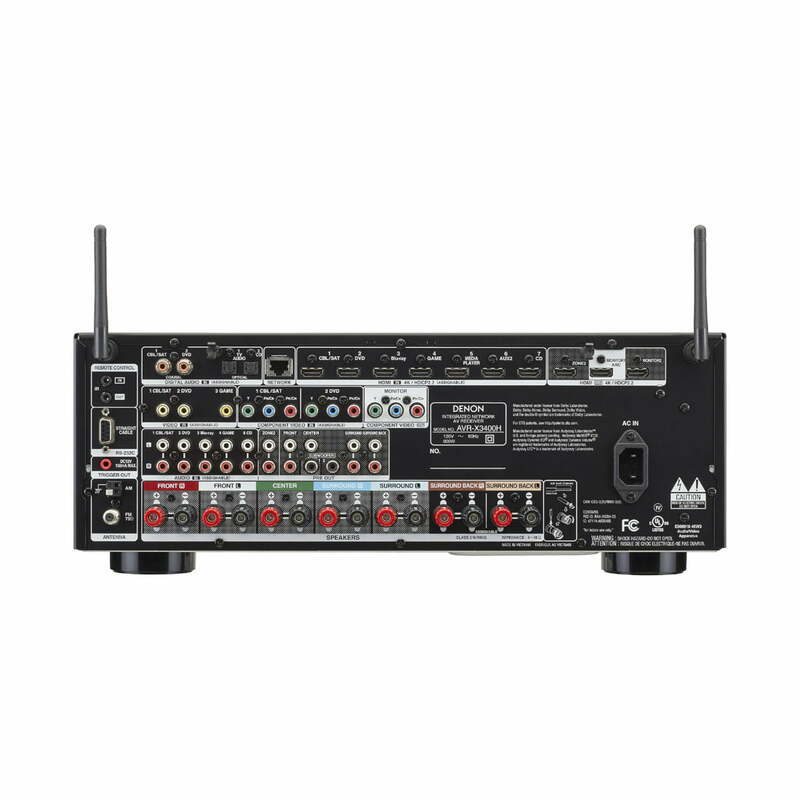 The AVR-X3400H’s can also be used to control select external audio/video components connected via HDMI which support HDMI control. The receiver can even be controlled by your HDMI connected Smart TV.